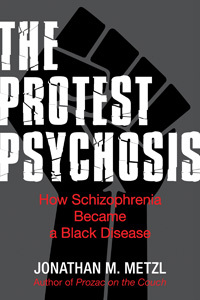 Jonathan Metzl’s The Protest Psychosis: How schizophrenia became a black disease (Beacon Press, 2010) is an ideal introductory text for introducing students to ethical issues surrounding politics, prejudice, and psychiatric diagnosis. The reader will experience the indignity and paranoia that African American men being treated for schizophrenia in the 1960s and 1970s had to face. They will come to understand how this “paranoia” was encouraged both by the civil rights movement and by the institutions who interpreted African-American individuals’ heightened concerns about racial prejudice as paranoia. This kind of “institutional racism,” Metzl argues, comes to life when the “established and respected forces of society” work together to maintain a status quo through institutions that were “destructive of human life” (202). While it is based on archival and interview research rather than sheer ethnography, Metzl’s book adds a historical perspective to the anthropological literature that critiques psychiatric practice in a remarkably empathic way. You will almost feel that he has been with the people that he has written about in a way that ethnographers often are, a fact that he attributes in part to the incredible quality and volume of case notes about his subjects that he found in the Ionia Hospital’s archives. This is a great strength and makes his tale both moving and effective. In addition, Metzl encourages us to take caution as we move towards the biologization of mental illnesses that makes it easier for us to cast aside our understanding of the ways causes, definitions, and treatments for mental illnesses may be more intrinsically political than we think. He begins with the example of draepetomania, or “runaway slave syndrome” that appeared in a (arguably obscure) southern psychiatry journal that recommended increased whipping and toe amputation as a treatment, as well as a 1913 article about the ways that ex-slaves could not cope with freedom (p.30). These are offensive and effective examples for Metzl to employ, as are images from psychiatric advertisements for antipsychotic medications in the 1960s and 1970s that features African Gods and angry black men. With examples such as these, readers will experience firsthand the profound ability that society offers psychiatrists (and the pharmaceutical industry that drives their treatments) to encourage or curtail individual achievement. Metzl stops short, though, of claiming that psychiatry as a discipline is wrong or politically motivated, but notes rather that mistakes can be made when psychiatric disorders are not understood in context. Most psychiatrists, even the ones at Ionia, he argued, genuinely intended to help people. Contextual understandings of psychiatric disorder, he argues passionately, are essential for people experiencing psychiatric distress to receive the best possible care. Thanks to Metzl’s determination to draw our attention to the suffering of Ionia’s inmates, we can only hope that his book will ultimately bring some justice to those who were so incredibly underserved. In addition, Metzl poses an important question for everyone engaged in psychiatric research. “What mechanisms exist for defining what is not a psychiatric disease, in addition to defining what is?” (206). As he explains, the pressures of medicalization continuously push the boundaries of health and illness outwards to capture more and more of the population. Diagnostic frames are continually in flux. We permit the increasing encroachment of biomedicine on human variation, Metzl suggests, at our own peril. However, as anthropologist Tanya Luhrmann points out in a strong critique of his book, Metzl does little to account for the ways the experiences of racism and social defeat may actually have gotten under the skin for some and contributed to their so-called “insanity.” There is a large body of literature suggesting that experiences of even perceived racism, as well as poverty, inequality, social defeat, seeming different, being in debt, being incarcerated, and so on, do seem to increase a person’s risk for schizophrenia. Certainly, in my own work, I have found that the incredible stress of everyday experience of people of all colors living in America seems to make healing from distress even more difficult to achieve. This is a piece of the story Metzl does not take up, and one that any instructor using this text should take up as a follow-on discussion of the book. As Luhrmann suggests, it is less painful to say psychiatric diagnosis is racist because then we have a seemingly fixable problem. But if we are really going to change the increased rates of schizophrenia for Afro-Caribbeans in England or the Netherlands or the increased rates of schizophrenia among African-Americans even in the U.S., or among migrants, or for anyone who is poor, or in debt, or incarcerated, or who has experienced trauma, then we are going to have to attend to much deeper social problems. We will have to acknowledge the culture of social defeat that surrounds people with severe psychiatric disabilities and cope with the impoverished and violent settings in which so many people, regardless of their geographical positioning in a wealthy country, often have to try and survive each day, and the impacts such experiences have immediately and intergenerationally on minds and bodies. We will have to understand the physiology of despair and resilience and the ways this physiology is individually shaped both genetically and epigenetically. This is a much harder story to tell, a much larger story. And it is going to take all of us – clinicians, historians, social scientists, biomedical scientists, neuro-people, ethicists, people who experience psychiatric disabilities, and you and your mother – to figure out how we can try and change the situation for the generations to come. Metzl provides a deeply moving look into social injustice, and he helps us get the conversation started. Thank you, Jonathan, for your wonderful book. Myers N. Book Review: Jonathan Metzl’s The Protest Psychosis. Somatosphere. 2011. Available at: http://somatosphere.net/2011/book-review-jonathan-metzls-protest.html/. Accessed April 24, 2019. Myers, Neely. 2011. Book Review: Jonathan Metzl’s The Protest Psychosis. Somatosphere. http://somatosphere.net/2011/book-review-jonathan-metzls-protest.html/ (accessed April 24, 2019). I suppose I am not surprised, but am nevertheless disheartened, by just how easily even anthropologists accept a normative (highly pathologizing) model of psychosis. Such assumptions are even more ironic given the larger context of Metzl's work. Mightn't we all pause to reflect on whether or not psychosis really is or should be the object of primary prevention efforts? Why not investigate the alternative constructs, emphasizing mad culture and discourse, promoted by actual consumer/user/survivors? Why not stop to ask who it is, in the present, that is falling prey to damaging cultural assumptions about the boundaries of illness and health, mental "order" and disorder? I wrote a blog post on my take on the debate. Thanks for the review. Pingback: Soul History – The Short Version | I Hear Voices-Can You Hear Them Too?